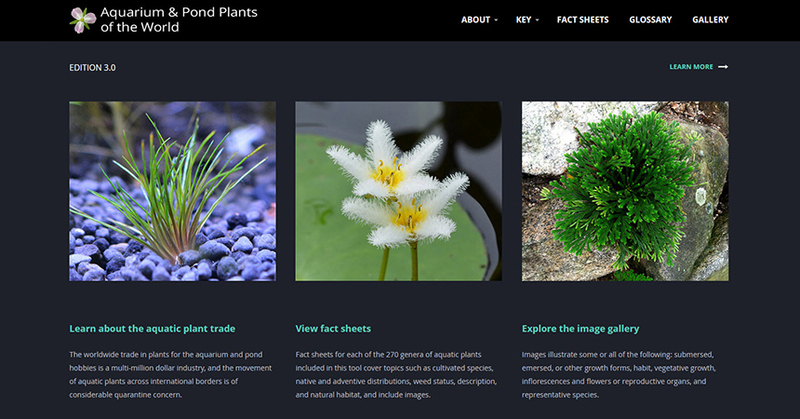 ITP is pleased to announce the release of Aquarium and Pond Plants of the World, Edition 3 (APPW e3), a major update to the tool’s 2007 second edition. The worldwide trade in plants for use in aquaria and ponds is a dynamic, multi-million dollar industry, where cultivated plants are exported from tropical and subtropical regions to countries around the world. This movement of plants across international borders is of considerable quarantine concern, particularly since many aquatic plants have the ability to disperse widely and become dominant in waterways, displacing native species. APPW e3 aims to cover all genera of aquatic plants cultivated commercially in nurseries and private collections around the world. Many of these genera include species that are currently considered weeds or have the potential to become invasive. APPW e3 is intended for officials at U.S. ports of entry and state departments of agriculture, but it may also be helpful for others, such as aquatic plant nursery managers, to help them become aware of invasive aquatic species in their stocks or among new acquisitions.